CerMaxä high temperature, heat and flame resistant thermal insulating ceramic fiber tape will withstand temperatures of 2000°F / 1093°C continuous exposure. This tape is available with fiberglass or wire reinforcement to give the tape dimensional stability. Applications for this product include thermal insulation and/or protection of wires, cables, hydraulic hoses, pipe and tube, as well as affording energy savings and personnel protection. These tapes are also commonly used as gasket seal tapes for high temperature boiler doors, stoves and burner apparatus. The tape is available in Plain and Drop Warp Styles. 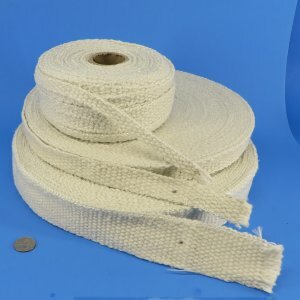 Drop Warp tape has several of the center lengthwise yarns missing during weaving, and allows the tape to be easily used for bolt-hole applications (sometimes called ladder tape).